When I was at the ALA Annual Conference, I talked to the Penguin Random House representative who spoke highly of DC's new imprint called the Young Animal which was created by Gerard Way, the leader singer of My Chemical Romance. I asked the representative about the imprint's targeted audience and content which he suggested were appropriate for teens. I wanted to find out for myself and asked for his suggestion on where to start. He told me he is a big fan of Shade, the Changing Girl by Cecil Castellucci. When I saw it was an advanced copy was available for review on Netgalley I thought I would try it. 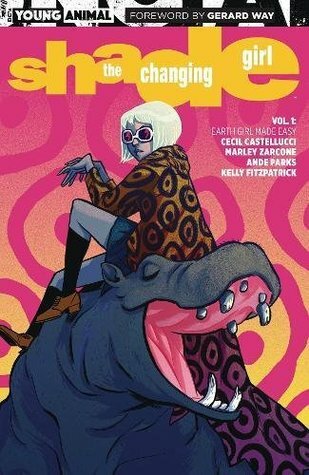 Shade, The Changing Girl, will be published on July 18, 2017. Description: Far away on the planet Meta, Loma's going nowhere fast. She's dropped out of school, dumped her boyfriend and is bored out of her mind. She longs to feel things. That's where her idol, the lunatic poet Rac Shade, and his infamous madness coat come in. Loma steals the garment and makes a break across galaxies to take up residence in a new body: Earth girl Megan Boyer. Surely everything will be better on this passionate, primitive planet with a dash of madness on her side and this human girl's easy life. 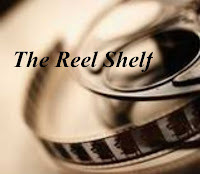 Only now that she's here, Loma discovers being a teenaged Earth girl comes with its own challenges and Earth may not be everything she thought it'd be. Megan Boyer was a bully who everyone was glad was almost dead, and now Loma has to survive high school and navigate the consequences of the life she didn't live with the ever-growing and uncontrollable madness at her side. Not to mention that there are people back on her homeworld who might just want Shade's coat back. Review: It did not take me long to figure out that this graphic novel is not for me nor would it appeal to my students. The plot is pretty simple despite its non-linear narrative structure. Loma, a birdlike alien creature, is bored on her planet and desires adventure so she dons on a madness coat and turns into a spirit that inhabits the body of Megan, a comatose high school queen bee. Loma is disheartened to find out that Megan was a mean girl that pretty much everyone hated. Loma tries to amend Megan's wrong meanwhile Megan's parents and friends are more shocked about Megan acting like a real human being with emotions and empathy rather than her weird alien powers. Despite the colorful and vibrant illustrations of the graphic novel, I was bored throughout reading it. The plot was just okay and the characters failed to pique my interest. I didn't get a good grasp on who Loma is before she inhabited Megan. I also couldn't drum up any sympathy for Megan who was a big bully that took a lot of drugs and ended up drowning. I also didn't feel there was a lot of depth to the story despite the trope of using the high school setting as a metaphor of explaining the tumultuous time of puberty. Plot points that didn't really connect where casually explained by the weird things happening in the story instead of an actual explanation. Words of Caution: There is some language, underage drinking and drug use. Recommended for older teens and adults only. What a disappointment! At least it was a quick read. Bummer. Sounds like this one as far as the story was a miss, at least it sounds like the illustrations were well done.